At the beginning of every year, I like to repeat an offer to my blog followers that I started in 2015. 2017 will be no different. It is in regards to the three printed supplements from A Peek Inside the Walls series that my research partner, John Elliott and I wrote and published. The offer is a simple one. When you order any or all of these three supplements, I will include FREE SHIPPING to anywhere in the continental United States. Shipping costs to Hawaii, Alaska, Canada, Mexico and other international locations can be quoted upon request. NY residents please add 8% sales tax. This offer is valid now until the end of May (ending May 31, 2017). Please include the promo code PEEK2017 in your email subject line so I know to apply the Free Shipping rate to your order. See supplement descriptions and ordering instructions below. Thank you and have a great 2017. One supplement = US $8.50 (includes any one supplement of your choice) + FREE SHIPPING = Total US $8.50. Two supplements = US $8.25 each (includes any two supplements of your choice) + FREE SHIPPING = Total US $16.50. Three supplements = US $7.50 each (includes any three supplements of your choice) + FREE SHIPPING = Total US $22.50. Released in March, 2011, A Peek Inside the Walls: The Final Days of the Lincoln Conspirators (maroon cover)(24 pages). This was our first published booklet in the “A Peek” series and was meant to compliment our 2011 live presentation given at the Surratt House Museum and Surratt Society Lincoln Assassination conference. It was a ‘supplement’ for that talk. Since then, each publication in this series has been called a supplement. This supplement features a chapter called Who Gave the Signal to Spring the Traps? 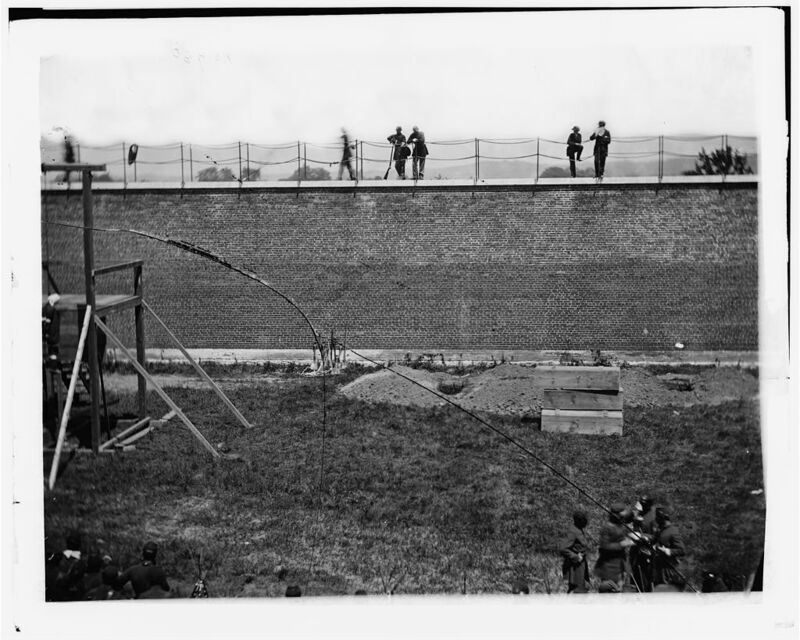 in which our research challenged a long-standing historical belief that the man dressed in white, seen standing on the scaffold in the Alexander Gardner conspirator execution photos, was Christian Rath, the executioner. After conducting a thorough photographic analysis of the evidence and an extensive review of many first-person eyewitness accounts and resources, this belief was proven to be inaccurate. Due to poorly made assumptions, early misidentifications and, in one case, blatant fraud, our research led us to the solid conclusion that accepted history on this subject was wrong. The man in white was NOT Christian Rath. If you are like us, you’ll find the trail of evidence to be fascinating and the conclusions credible. When the content of this supplement was first presented to the public at the 2011 conference, renown Lincoln Assassination expert, Dr. Terry Alford, Professor of History at Northern Virginia Community College, was in attendance. After our presentation, Dr. Alford addressed the audience and offered the following statement: “It’s very difficult to do anything original and you guys have done it. I think you deserve the highest praise for it because it’s truly remarkable”. The research in this supplement has continued to receive enthusiastic acclaim from the Lincoln Assassination Research Community and the public and has been written up in articles for the Surratt Society Courier and the Lincoln Herald (the oldest Lincoln-related publication in print today). 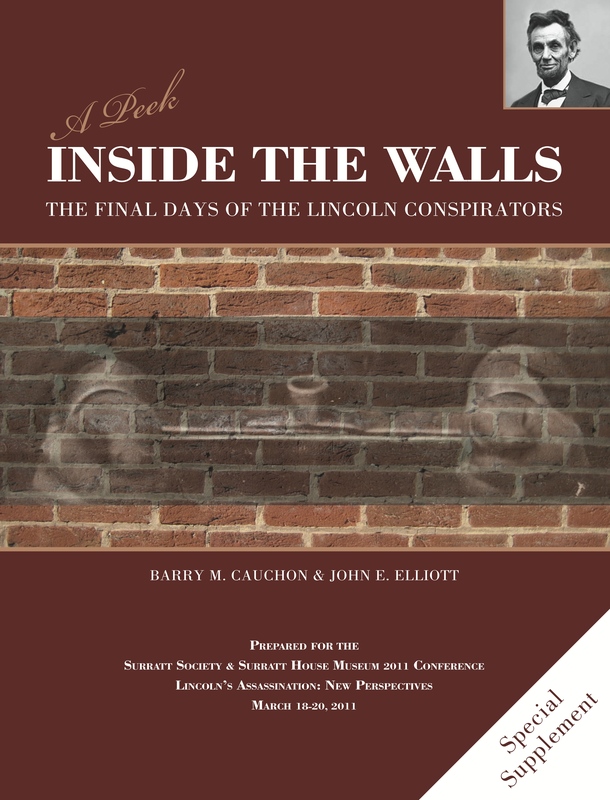 In March, 2012, we published our second conference supplement called A Peek Inside the Walls: The Final Days of the Lincoln Conspirators. 13 Days Aboard the Monitors: The Early Incarceration of the Conspirators, the Mug Shot Photo Sessions and the Truth about the Hoods (blue cover)(28 pages). It’s a long title but this supplement is packed with great information featuring the facts, tales and plausible theories surrounding the early incarceration of the conspirators aboard the U.S.S. Saugus and U.S.S. Montauk prior to being sent to the Arsenal Penitentiary. This supplement was revised in the fall of 2013 when additional information came to light. Part 1: The Early Incarceration of the Conspirators. For thirteen days in April of 1865, the Union Navy, under the direction of the War Department, became an unexpected participant in the story of the Lincoln conspirators. From April 17 to April 29, eight men suspected in the attacks on President Lincoln and Secretary of State William Seward, were sent to the Washington Navy Yard for confinement aboard two ironclad monitors anchored offshore. Kept below decks under intolerable conditions, these prisoners were forced to wear iron restraints on their wrists and ankles, as well as hoods over their heads. They were interrogated and photographed, but mostly just left to sit in silence for endless hours of isolation to contemplate their fates. Part 2: The Mug Shot Photo Sessions. Twenty-six famous, or infamous, ‘mug shot’ photographs of these prisoners were taken by Alexander Gardner during the prisoners’ time on the monitors. History has allowed many people to believe that all twenty-six images were shot during a single photo session on April 27. However, solid evidence, partnered with photographic analysis, suggests that multiple sessions were conducted. The results offer an intriguing and plausible alternative to the long-held ‘single photo session’ belief. •How many hood types were created? •Who did, and did not, wear the hoods? •When and where were each type worn? 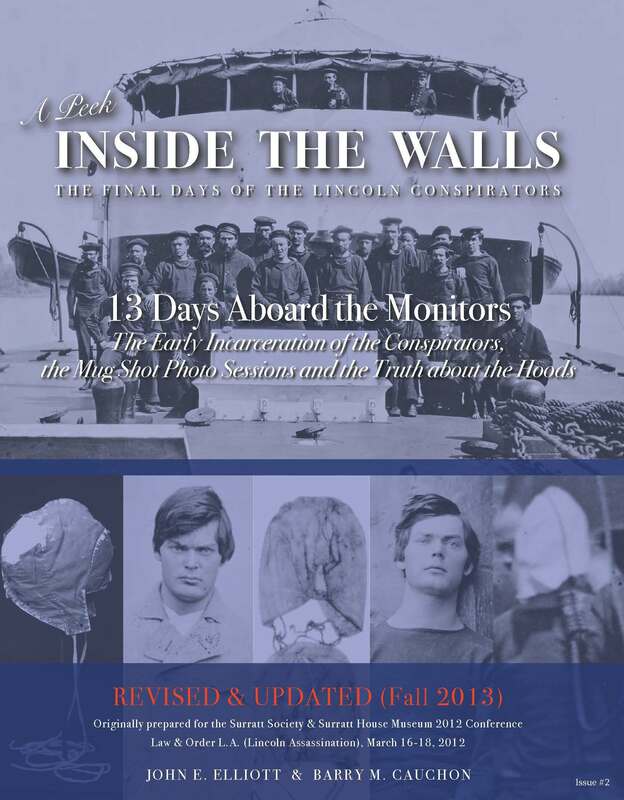 In August, 2013, we published our third supplement called A Peek Inside the Walls: The Final Days of the Lincoln Conspirators. The Mystery of John Wilkes Booth’s Autopsy Photo (sepia cover)(24 pages). 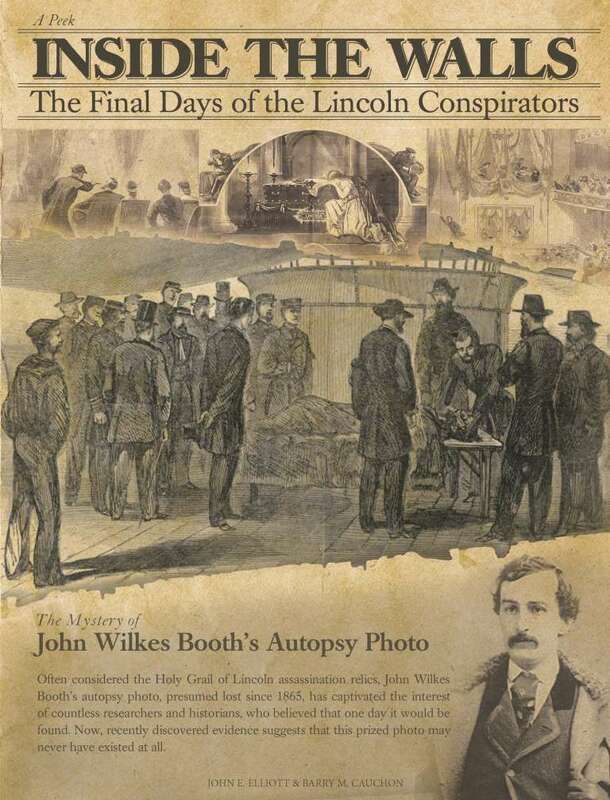 Often considered the Holy Grail of Lincoln assassination relics, John Wilkes Booth’s autopsy photo, presumed lost since 1865, has captivated the interest of countless researchers and historians, who believed that one day it would be found. Now, recently discovered evidence suggests that this prized photo may never have existed at all. To purchase any of these supplements, please contact me by email at barryssentials@hotmail.com and indicate which supplement(s) and the quantity of each you wish to have. Also, please include your shipping address. Remember to add the promo code PEEK2017 for free shipping. If you would like me to sign the supplements I am happy to do so…just ask. At present, John is unable to sign these as he resides in San Antonio, TX. These supplements ship from Corning, NY. PAYMENT: Upon receiving your email, I will send you a confirmation quotation with payment options. I accept PayPal, checks, money orders or bank drafts. Please include your shipping address and indicate which payment method you wish to use so I can be on the look out for it. All supplements are mailed from Corning, NY by USPS (United States Postal Services). AVAILABILITY: All three supplements are presently available. If the inventory becomes depleted, I will reprint as required. I will let you know prior to your payment of any delays you may be facing. Thank you for considering A Peek Inside the Walls. If you have any questions, please email me at barryssentials@hotmail.com. I’ll be happy to help assist you. 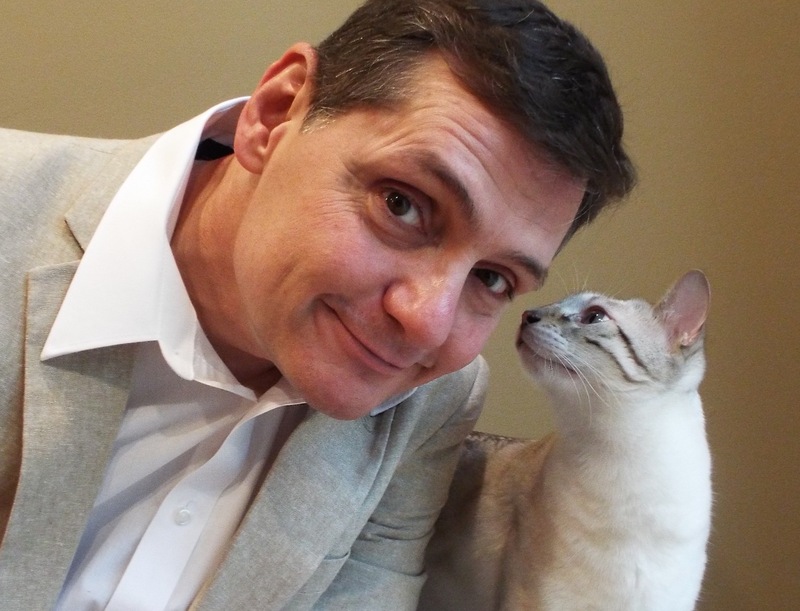 ABOUT BARRY & JOHN – Barry Cauchon and John Elliott have been active members in the Lincoln Assassination research community since 2009 and specialize in the incarceration and punishments of the Lincoln Conspirators. Their research has been published in the Lincoln Herald, Surratt Society Courier and are credited in numerous assassination-related books. Both have presented their work at several Surratt Society Lincoln Assassination annual conferences and have advised on film and documentary projects such as Robert Redford’s “The Conspirator” (2010) and National Geographic’s “Killing Lincoln” (2013). John and Barry have jointly written and published three supplements (booklets) under the series name “A Peek Inside the Walls: The Final Days of the Lincoln Conspirators”. Hi all: In August of this year, John Elliott and I formally dissolved our writing partnership due to time constraints and work commitments. We had enjoyed a wonderful four-year run of research and writing escapades that resulted in three self-published booklets (we call them supplements) written under the A Peek Inside the Walls: The Final Days of the Lincoln Conspirators series. The Surratt House Museum gift shop sells them individually or as a ‘three-pack’ if you are interested in purchasing them (http://www.surrattmuseum.org/su_gift.html). The booklist on the site isn’t quite up-to-date so call the gift shop directly at (301) 868-1121 and the nice folks there can help you. Getting back to our partnership dissolution, the one thing that didn’t end was our friendship and the desire to share what we’ve discovered. So, being that you can’t always keep a good team down, John and I have decided that we will do another supplement (our fourth). It is currently in the works and will feature the Lincoln conspirators’ trial room (recently restored at Fort McNair in Washington D.C.). The release of this supplement is planned for March, 2014. John is writing the piece and I will handle the images, illustrations and design layouts. We look forward to sharing this with you in the very near future. Tags: A Peek Inside the Walls, Arsenal Penitentiary, Building 20, fort mcnair, Grant Hall, john elliott, lincoln conspirators, Surratt House Museum gift, The Final Days of the Lincoln Conspirators, Trial Room, Washington D.C. EXCITING NEW DISCOVERY: Who Gave the Signal to Spring the Traps?